Collecting Carnival Glass and a short history of the companies that produced it, such as Fenton and Northwood. Carnival glass was first produced in the early nineteen hundreds and is a range of patterned, pressed glass suffused with an iridescent lustre, which reflects the light and makes the glass surface gleam with metallic highlights. The effect is achieved by spraying the hot surface of the glass with a metallic salt solution and then re-firing to set the iridescence. 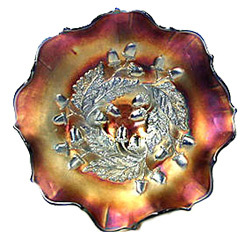 The United States was the home of Carnival Glass. It was developed there, and though other countries soon began to produce their own versions, most collectors begin with American carnival glass as it is the easiest to obtain. Although the patterns are formed in a mould, unlike pressed glass, carnival glass needs a lot of hand-finishing and decorating, and the iridescence means that the finished product doesn’t have that somewhat flat appearance often noticed in pressed glass. Carnival glass is a living glass, a vibrant and bright glass that reflects irridescent colour. Pressed glass products using this method first appeared in the US in 1905. They resembled the high lustre, hand blown pieces produced by high-class glass manufacturers like Tiffany. Rumour has it that Tiffany sales slumped when pressed glass companies began producing iridescent glass, Tiffany customers hating to think that poor people could now afford to have similar objects in their homes. Carnival Glass didn’t really interest collectors until the late 1950s, and the history of many early companies still isn’t fully-researched. A trawl through various books on glass produces a variety of dates and it seems that no-one is absolutely certain when the various manufacturers first developed their carnival glass products, although it is known that by 1905 the first cheap, carnival glass, that rivalled the expensive Tiffany glass, was in production. During the 1880s, hand-operated press moulds were developed by the American glasshouses, which enabled them to produce domestic glassware in large quantities much more cheaply than the traditional methods allowed. 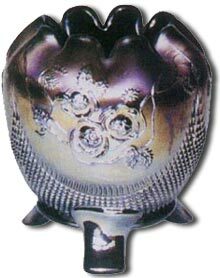 Unlike hand-blown glass which was time-consuming to produce, pressed glass was produced using moulds. Two moulds were used with the molten glass being poured into the outer mould and then the inner mould or plunger forced inside, under great pressure. Sometimes moulds were in two or more parts, and a trickle of the molten glass would seep through the gaps. Later, these seam lines would be polished out unless they were hidden in the intricate design. Initial products were made from clear glass, but gradually colours were introduced. The carnival glass manufacturers wanted to create a unique feel and an air of individuality and the glass needed a lot of hand-finishing. So, the glassmakers completed their creations in a variety of ways. 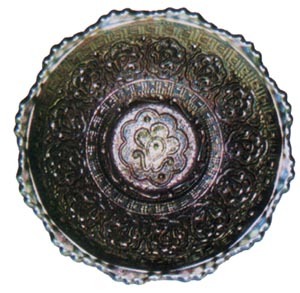 Sometimes they would very gently draw up the edges of a plate into a fluted shape, creating a bowl. They might add some rounded feet or using special tools would pinch or crimp edges, or make ruffles, pleats, frills or scallops. Gorgeous rose bowls and posy bowls could be formed by carefully pinching in the top edges of small basins, while tall vases were elongated by using centrifugal force which had the effect of stretching the malleable glass. Then the top edges where decorated by crimping. The most common shade of carnival glass is marigold, then amethyst, blue, green and red, which is probably the rarest of all. Other shades do exist, including black, pastel shades, and many varieties of the main colours such as amber, electric blue or sapphire. In addition, some of the colours were coated with white, altering the hues – ie; marigold and white is called peach opalescent. The colour refers to the base colour of the glass, not to the iridescence, and the best way to discover it is to hold the piece to the light and the base colour will show through. An amazing variety of items were created from carnival glass and many were intended for everyday use, rather than for decoration, and it is surprising how many items have survived. Rose bowls, plates, ashtrays, hatpins, salad bowls, cream jugs, punch bowls, plates, stemmed dishes, vases and hair tidies were just a few of the items that poured from the factories during the relatively short period that the glass was in production. America was the first country to produce carnival glass in commercial quantities and the five biggest companies were Northwood Glass, Fenton Art Glass, Imperial, Dugan and Millersburg, and each had their own specialities. In addition there were a few smaller countries which produced the glass including England, Australia, Czechoslovakia, Argentina, Estonia, Finland and Sweden. The glass was originally made to bridge a gap in the market by providing ornamental glass for those who couldn’t afford to buy the fashionable, expensive, iridised handmade glassware. However, by the 1930s, fashions changed as people began to follow Art Deco trends and carnival glass became less popular. It wasn’t until much later that it acquired the name Carnival Glass. It is believed to have become so unpopular that it was sold off cheaply to fairgrounds and offered as prizes. Whether or not this is true is irrelevant. 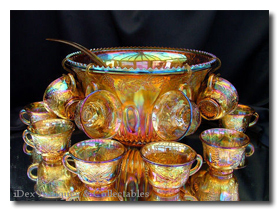 Other names for Carnival glass are poor mans Tiffany, Rainbow glass, Aurora glass and Taffeta glass. The enormous range of patterns means that collectors will always be searching for more pieces. It’s calculated that well over a thousand different patterns were produced by the American companies, and each pattern in a range of different colours, shapes and sizes. It’s not hard to see why a serious carnival glass collection would be hard to complete. 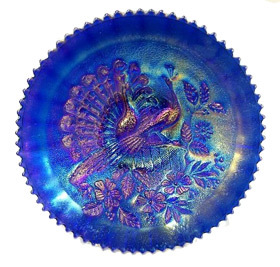 Most Carnival glass patterns were given names that echoed the design, such as leaf and beads, starfish, pineapple and bow, beaded cable, peacock tails, persian medallion, open rose and fluffy peacock. Flowers, fruits and leaves were very popular designs and included pansies, roses, water-lilies, blackberries, grapes, cherries, oak and vine leaves. Sometimes horse heads, dragons, birds, or kittens were featured. Geometric shapes or abstract patterns are also found, and are shown to perfection by the iridescence which catches the light as the piece is turned, emphasising the facets. Because of the way that carnival glass is manufactured, no two items are quite the same. if you place two dishes or vases of the same pattern, shape, colour and size from the same manufacturer, side by side, you will notice subtle differences. One may seem more blue than purple, or have a section which gleams gold, or maybe have a pink or green tinge. A single item of carnival glass on display is beautiful; a collection, especially if illuminated by spotlights, or perhaps placed in a north-facing window makes a truly stunning display. Prices of carnival glass vary considerably and depend on the manufacturer, the colour, the design and where you buy it from. Even though it is very popular and sought after by collectors, it is still possible to pick up bargains. Normally you can expect to pay anything from £20 upwards and for rare pieces upwards could well mean hundreds or even thousands of pounds. decorated with Peacock at the Fountain in aqua opalescent. Carnival glass comport by Northwood Glass c1920’s. Three Fruits pattern with basket weaved back. Marked “N”. Measures 3″ high. Color amethyst. 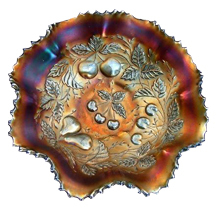 Carnival glass bowl in the Acorns pattern by Millersberg, USA.